Operations Manager collects various essential data on Automation Workshop performance. The information is brought to user in a convenient and easy-to-understand summary overview and statistics screen. Operations Manager allows You to monitor executed Tasks, active Triggers, service uptime, memory use and other parameters to help ensure that the software is performing at its best capacity. Operations manager provides real-time data on software performance. 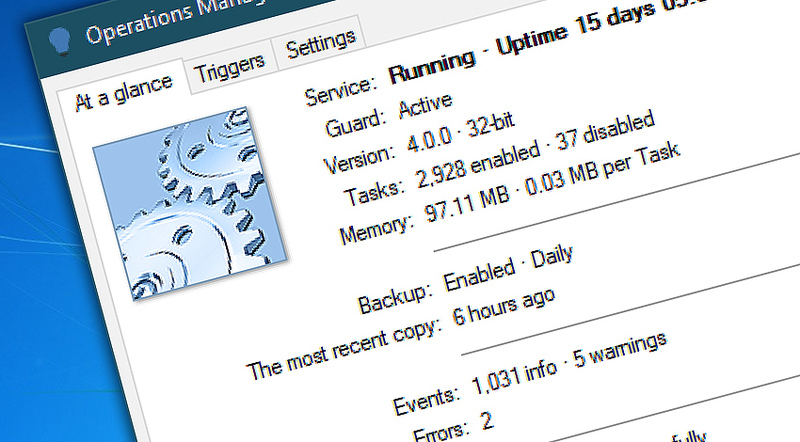 See Service status and current uptime. Ensure that the service guard is active and monitors service status. See memory use of the software. Check if backups are enabled and performed. Operations Manager · see detailed information on Operations Manager.